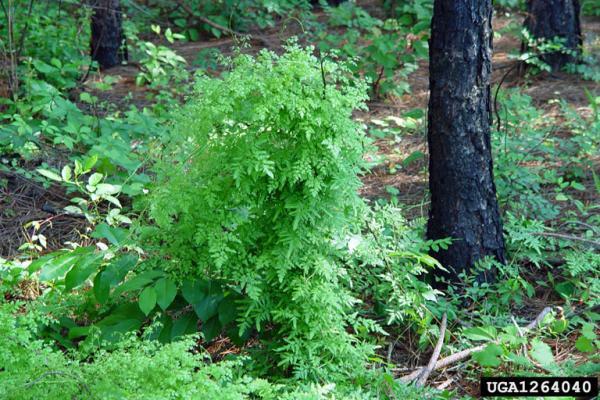 Lygodium japonicum is a vine-like fern with a highly developed ability to climb herbs, shurbs and trees. Its invasiveness arises from its ability to climb to heights of 30m and can smother vegetation by forming dense mats which displace native species, alters fire ecology and impacts rare, threatened and endangered species. 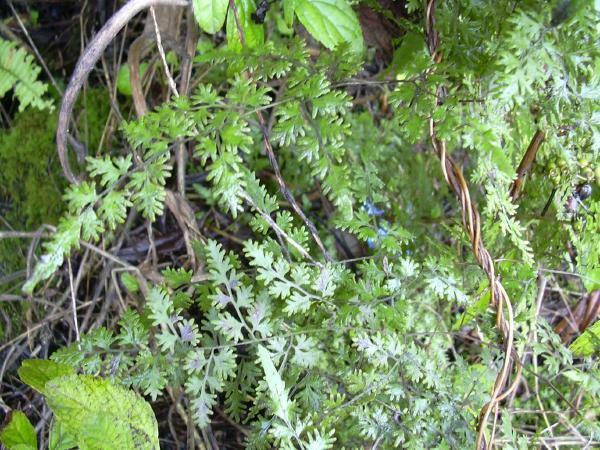 Lygodium japonicum is a perennial vine-like fern that can climb and twine around herbs, shrubs, and trees and reach lengths of up to 30 m. The fronds are long, lacy, and finely divided along the wiry vines. Climbing ferns are rhizomatous, and rhizomes are 1-3cm below soil surface. This vine arises from beneath ground with its branches and widely creeping rhizomes that are slender, black, and wiry. L. japonicum's stem are slender but difficult to break. They can appear green, reddish, or straw coloured. Leaflets are highly dissected or lobed, arranged on branches off the rachis, and their lower surfaces are pubescent with short curving hairs. When no sporangia are present the lobes of the leaflets are pointed or rounded at the tips and flat at the margins. Fertile leaflets are contracted in shape, with their margins curled over double rows of sporangia. Tan-brown fronds are found persisting in winter, but in more southern and warmer regions these fronds will remain green. Fronds are opposite on vine, compound once- or twice-divided, varying in appearance according to the number of divisions, but are generally triangular in outline. Fronds come in lengths of 8 to 15cm long and 5 to 8cm wide. (Bodner, UNDATED; FDEP, UNDATED; and Munger, 2005). In sub-tropical climates L. japonicum is evergreen and may actively grow throughout the year as both sporophytes and gametophytes. L. japonicum in sub-temperate climates is damaged by hard freezes with many or most leaflets turning brown. Leaflets may die in the winter but the stalks usually remain intact, providing a \"ladder\" for climbing stalks of new growth when temperatures rise again. Wind, dust, animals, clothes, and equipment can carry the many thousands of tiny spores released per plant. L. japonicum is thought to prefer soils of circumneutral pH (Center for Aquatic and Invasive Plants, 2005; and FDEP, UNDATED). An economic product of L. japonicum is it spores which are often sold \"as is\" as raw spores. L. japonicum treatments are said to help kidney and urinary functions; reduce swelling, colds, and fever; ease cough and congestion; and work as an anti-gonorrheal agent or as a general \"blood tonic\". The long, fibrous, twine-like rachis of the fronds has found obvious applications in basketry and weavings (Lygodium Task Force, 2001). Lygodium japonicum grows in moist or, and in various disturbed sites such as yards and roadsides. It can tolerate both sunny and shady environmental conditions. It is often found occurring along highway right-of-ways, especially under and around bridges, invading into open forests, forest road edges, and stream, swamp, marsh, lake, and creek margins. It will also be frequently found in dry woods, along ditches and rivers, or it can be scattered in open timber stands and plantations. (Bodner, UNDATED; Center for Aquatic and Invasive Plants, 2005; and FDEP, UNDATED). The Lygodium Task Force, (2001) provides a detailed account of the reproductive behaviour of L. japonicum: \"This species reproduces sexually during the sporophyte and gametophyte stages. Fertile pinnae of the sporophytes produce spores within sporangia. When released from the sporangia, the spores will, given needed moist environmental conditions, germinate into tiny, thin-tissued plants called prothallia, the gametophyte generation (where eggs and sperm are formed). The gametophytes have both male and female organs producing sperm and ovules. Fertilization gives rise to the familiar plants (the sporophytes). Spores of the Lygodium genus have very thick walls, giving these propagules long environmental viability. In shady, moist habitats L. japonicum is a homosporous fern which may engage in three types of sexual reproduction: 1) intragametophytic selfing, involving the union of egg and sperm from the same gametophyte; 2) intergametophytic selfing, the cross-fertilization of gametophytes produced by spores from the same sporophytes; and 3) intergametophytic crossing, the cross fertilization of gametophytes arising from different sporophytes.\"
L. japonicum was introduced as an ornamental plant in North America from Asia in 1932 (FDEP, UNDATED). 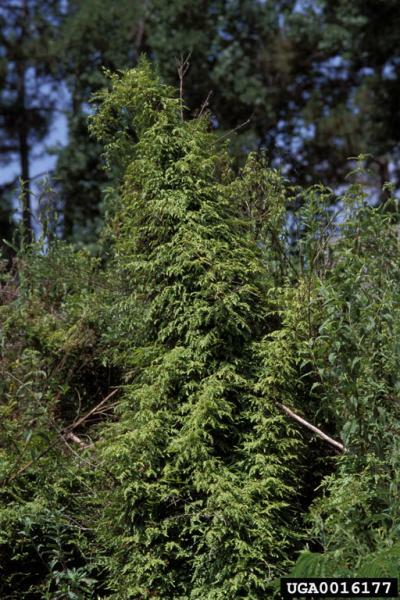 Recommended citation: Global Invasive Species Database (2019) Species profile: Lygodium japonicum. Downloaded from http://www.iucngisd.org/gisd/species.php?sc=999 on 22-04-2019. Once established in a community L. japonicum displace native species and alters local fire ecology by providing ladder fuels, leading to greater incidence of crown fire in communities that are ill-adapted to crown fire. Given enough time, L. japonicum can completely dominate a native habitat causing the collapse of the natural community. It is the reproductive strategy of L. japonicum, or intragametophytic selfing, combined with the ease with which spores are wind dispersed which allows this fern to spread and proliferate rapidly. It has also been determined that L. japonicum is hardier than native species in low light environments allowing it to thrive and expand when natives cannot (Lott and Volin, 2001; and Munger, 2005). Munger (2005) reports that L. japonicum may also impact rare and threatened taxa. 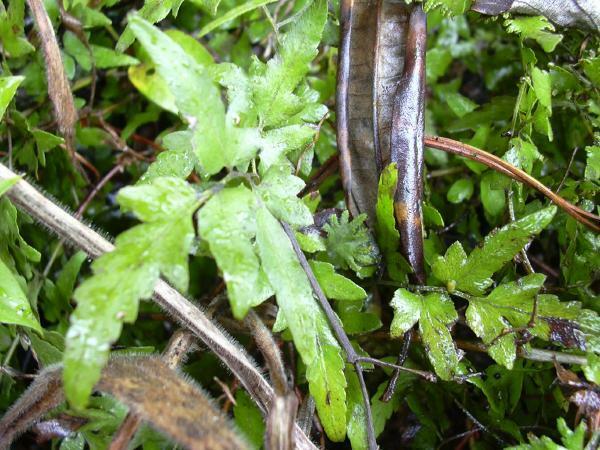 Recent studies indicate that that this species, in Florida, threatens the rare plant ray fern (Actinostachys pennula), as well as the endangered Georgia bully (Sideroxylon thornei), common dutchmanspipe (Aristolochia tomentosa), and branched tearthumb (Polygonum meisnerianum). 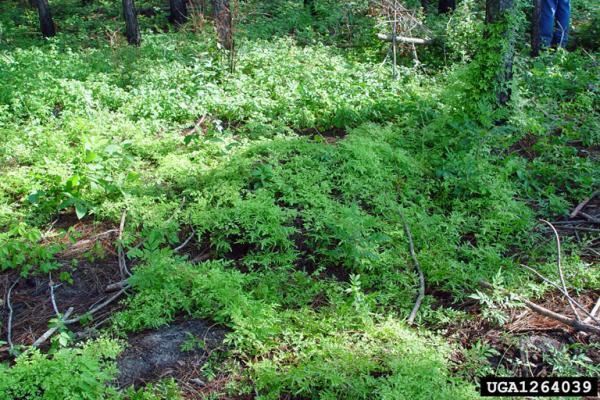 L. japonicum also poses an unknown economic threat to the tourism industry through its degradation of natural resources in parks and natural areas (Lygodium Task Force, 2001). Chemical: Research by the Lygodium Task Force (2001) has repeatedly shown that Rodeo has the best long-term control over L. japonicum. When Garlon 3A, Garlon 4, and Pathfinder II was use 100% regrowth occured within 8 months, whereas with Rodeo only approximately 5% regrowth of L. japonicum was observed after 8 months. Biological: L. japonicum's more temperate distribution would require the use of biological control agents that are tolerant of cold. Unfortunately, the use of such cold hardy agents might place the native species L. palmatum at risk. Potential candidates have been found but it is unknown how specific their level of predation is. Further research is necessary to determine if the introduction of natural predators would inadvertently hard the native L. palmatum in North America. One of the more prospective biological control agents identified is a rust fungus, Puccinia lygodii, native to South America and naturalized in the United States, which has recently been found infecting L. japonicum. P. lygodii is a glasshouse pest of ornamental Lygodium (Jones, 1987), and may eventually have a role in the control of L. japonicum and its close relative L. microphyllum. P. lygodii infections are characterized by the lower surfaces of the pinnules becoming covered with cinnamon-brown eruptive pustules. Necrotic areas develop around mature, erupted, and coalesced pustules. Severely infected foliage wilts and dies. Microscopic observations of the pustules and spore morphology revealed these eruptive structures to be uredinia (Gooslby et al. 2003; Pemberton et al. 2002; and Rayachhetry, 2001). Informations on Lygodium japonicum has been recorded for the following locations. Click on the name for additional informations. Goolsby, J. A., A. D. Wright, and R. W. Pemberton. 2003. 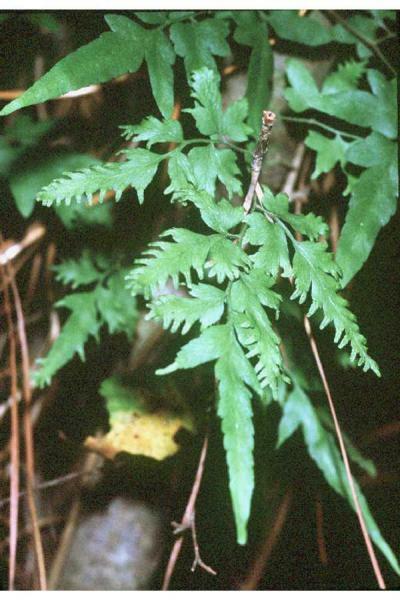 Exploratory surveys in Australia and Asia for natural enemies of Old World climbing fern, Lygodium microphyllum: Lygodiaceae Biological Control 28 (2003) 33-46. Lygodium Task Force. 2001. Lygodium Management Plan for Florida.Florida Exotic Pest Plant Council. Pemberton, R. W., J. A. Goolsby, and T. Wright. 2002. Old World Climbing Fern. Biological Control of Invasive Plants in the Eastern United States. Rayachhetry, M. B. 2001. Pathogenicity Assessment of Puccinia lygodii, a Potential Biological Control Agent of Lygodium japonicum in Southeastern United States. Plant Diseases 85:232, 2001. Bodner, T. UNDATED. Japanese Climbing Fern. Center for Aquatic and Invasive Plants . 2005. Lygodium japonicum (Thunb.) Sw. Lygodiaceae/Climbing Fern Family. University of Florida. FDEP (Florida Department of Environmental Protection). UNDATED. Japanese climbing fern ( Lygodium japonicum). Bureau of Invasive Plant Management. ISB-AFVP (Institute for Systematic Botany - Atlas of Florida Vascular Plants). 2006. Lygodium japonicum . USF: University of Southern Florida. Lott, M. C., J. C. Volin, R. W. Pemberton, and D. F. Austin. 2003. The Reproductive Biology of the Invasive Ferns Lygodium microphyllum and L. japonicum (Schizaeaceae): Implications for invasive potential. American Journal of Botany 90(8): 1144-1152. 2003. Lott, M. S., and J. C. Volin. 2001. 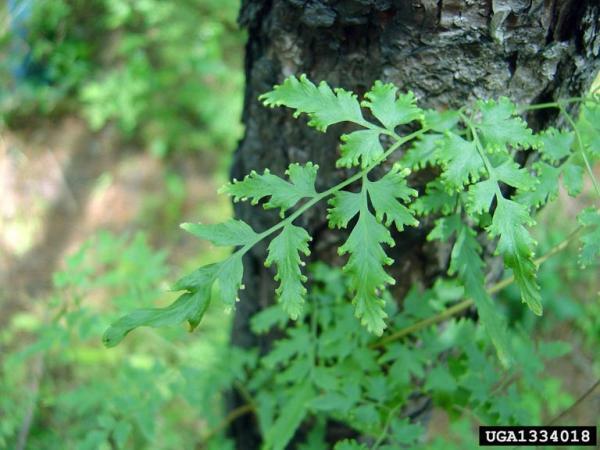 Dispersal, reproduction and physiological ecology of two invasive non-indigenous fern species, Lygodium microphyllum and Lygodium japonicum. Wildland Weeds Fall 2001 edition: Seapro 4/c Control and Release P/ (Florida Atlantic University). Munger, Gregory T. 2005. Lygodium spp. In: Fire Effects Information System, [Online]. U.S. Department of Agriculture, Forest Service, Rocky Mountain Research Station, Fire Sciences Laboratory (Producer). USDA-GRIN (Germplasm Resources Information Network). 2006. Lygodium japonicum . National Genetic Resources Program [Online Database] National Germplasm Resources Laboratory, Beltsville, Maryland.